BRIDGEWATER, NJ – Street-hardened police officers accustomed to traffic stops, petty crime, arresting bad guys and calming frazzled nerves came together two weeks ago in Somerset County to hone a new skill. 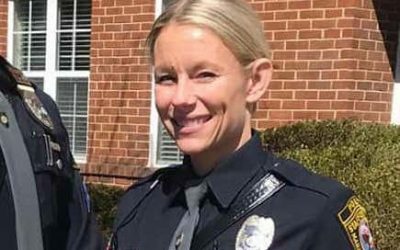 Side-by-side, the 25 officers were tested by a rigorous curriculum that challenged them to become role models and teachers in an ongoing national effort to counteract negative influences that make good kids make bad decisions. Part of their training included teaching a class the day before graduation at the Van Derveer Elementary School in Somerville. 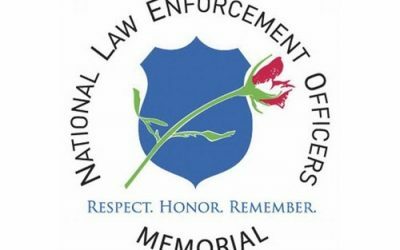 The officers are members of several local police departments – Bernardsville, Montgomery, Warren and Watchung in Somerset County; Plainsboro, South Amboy and the Middlesex County Sheriff’s Office; West Windsor, Springfield, Wardwick, Upper Saddle River, Madison and Stafford Township. Others came from out-of-state, including Pennsylvania, Virginia, Massachusetts, Vermont, and a member of the US Coast Guard Police from Kodiak, Alaska. Last Friday, they all graduated as certified Drug Abuse Resistance Education officers, each ready to return to their towns and begin their new assignments where they will work the front lines to help kids cope with the social pressures faced each day in the classroom, in the hallways, on the playground, street corners and in their neighborhoods. A welcome by-product of the friendly police presence is to reassure students that they should not fear, but rather, look to police as adults they can trust and rely upon. One of the major thrusts of the D.A.R.E. curriculum is designed to help younger elementary school students, as well as middle and high school students to make decisions for safe and healthy living, and learn about the ramifications of tobacco, drug and alcohol abuse and addiction, the risk factors and the inevitable mental and physical damage to an individual, as well as family and friends. The officers heard from Somerset County Prosecutor Michael H. Robertson, a major proponent of the D.A.R.E. program. Since his appointment last year – previously he served eight years as an Assistant US. Attorney in Newark – Robertson has mounted a vigorous public awareness campaign about opioid abuse, which has reached epidemic proportions throughout the country. Retired Capt. 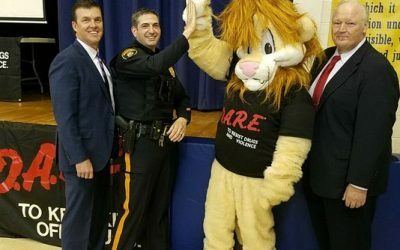 Jack Bennett, communications officer for the Somerset County Prosecutor’s Office, is the D.A.R.E.  training officer for New Jersey. D.A.R.E. was founded in 1983 in Los Angeles and has proven so successful that it is now part of the curriculum in 75 percent of the nation’s school districts and in more than 52 countries around the world. 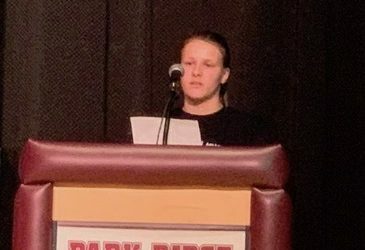 As the opioid crisis, bullying, gun violence and other issues confront students, D.A.R.E. has taken on added significance, according to Bennett. “When D.A.R.E. started it was really a community-based program designed to get businesses, everybody involved, a real community buy-in.” Bennett said. The program languished in the late ‘90s and for several years thereafter because of budgetary cuts, but has recently made a resurgence, according to Bennett. “There’s a demand for training because of the opioid problem,” he said. The national D.A.R.E. program be coming out with a new opioid educational program that will be released in July at the D.A.R.E. national conference in Florida, according to Bennett. The training team consisted of a D.A.R.E. America educator from New York, a facilitator from Connecticut and 4 mentors, all veteran D.A.R.E. 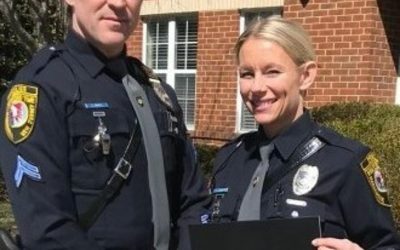 Officers from Maryland and New Jersey. The intense, 80-hour D.A.R.E. program was held at the Somerville Elks Lodge #1068 on Route 28. The Elks helped to underwrite the expense of the two-week course, according to Bennett. “By them hosting these trainings, by extension they are teaching thousands of kids not only here in Somerset County buy throughout the country,” Bennett said. “What we do with the trainees is to highlight what the Elks are all about and they are encouraged to go back to their towns and connect with their local Elks Lodge and get involved in their local drug awareness program,” he added. 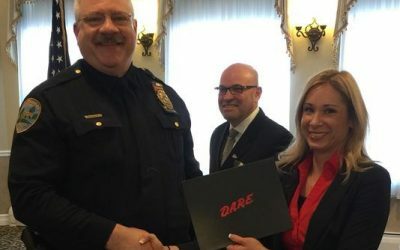 In addition to their certificates, each graduate was presented with a stuffed toy lion, the national D.A.R.E. program’s mascot. “The lion symbolizes courage and strength, needed to stand up to bullying and peer pressure,” Bennett said. N.J. D.A.R.E. Continues to Grow! New Officers Trained And Ready To Teach D.A.R.E. 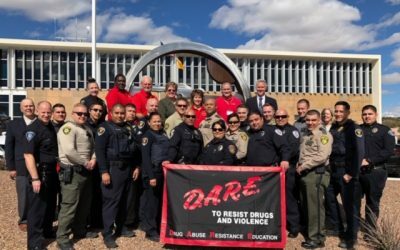 During September of 2017 the D.A.R.E. 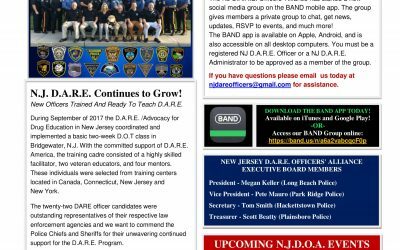 /Advocacy for Drug Education in New Jersey coordinated and implemented a basic two-week D.O.T class in Bridgewater, N.J. With the committed support of D.A.R.E. America, the training cadre consisted of a highly skilled facilitator, two veteran educators, and four mentors. These individuals were selected from training centers located in Canada, Connecticut, New Jersey and New York.